During the last decades, development of specific agents affecting T helper cell subpopulations, i.e., Th1, Th2 and Th17, differentiation has drawn special attention. Many natural products were reported as a good agent for modulating the immune response by regulating of the differentiation of T helper cell subpopulations. These products are potential to be the immunemodulators for treatment of various diseases including infectious diseases, cancers, autoimmune diseases and also arthritis. In this study, we aim to study the immunomodulatory effects of the Operation BIM product. We investigate the possible effect of an Operation BIM product, Arthrinox, on the controlling of T helper cell subpopulation differentiation. The objective of this study is to investigate the possible effects of the Operation BIM product Arthrinox on regulation of T helper cell subpopulations. The levels of various cytokines of blood collected from healthy donors before and after taking Operation BIM product (Arthrinox capsule) for 15 days were compared. Blood (5 ml. using heparin as anti-coagulant) were collected from each subject at day 0. According to their groups, subjects took Arthrinox capsule or placebo (4 capsules/day) everyday for 15 days. Afterwards, blood was collected (5 ml. using heparin as anti-coagulant) for the s econd time at day 16. Peripheral blood mononuclear cells (PBMCs) were isolated from the collected blood by using Ficoll-Hypaque gradient centrifugation. PBMCs were in vitro stimulated with or without anti-CD3 monoclonal antibodies (clones OKT3) and cultured for 24 hours at 37oC in a CO2 incubator. The cell cultured supernatant were collected and centrifuged 20,000 rpm, 2 min. 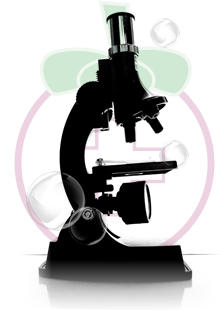 The cell free supernatants were separated and stored at -70°C for determination of cytokines. Tumor necrosis factor (TNF) is present at biologically significant levels in Rheumatoid arthritis (RA) synovial tissue and fluid, and seems to parallel the extent of both inflammation and bone erosion. TNF triggers several of the most central and critical events in the acute and chronic synovial inflammation and ultimate tissue destruction characteristic of RA, including induction of multiple additional cytokines and chemokines, expression of adhesion molecules and increased levels of class I MHC determinants, synthesis and release of proteases and prostaglandin E2 by synovial fibroblasts (which is important in erosion of cartilage and bone) and synovial neoangiogenesis. Some data suggest that monocytes from patients with early RA hyperproduce TNF when activated. Taking all the data into consideration, one can reasonably conclude that TNF is one of the most important cytokines in the pathogenesis of RA (1). IL-17A is the signature cytokine of Th17 cells and has pleiotropic effects on many cell types, inducing the upregulation of NF-κB, HLA class I, and several proinflammatory cytokines, including TNF-α, IL-1β, IL-6, and GM-CSF. Of relevance to the pathogenesis of RA are the effects of IL-17 in driving osteoclastogenesis, leading to bone resorption (6). Neutralization of IL-17A in mice decreased the severity of antigen-induced arthritis (7). In addition, the severity of CIA is reduced in IL-17-deficient mice and mice administered IL-17-neutralizing antibodies (8). Interleukin-2 plays a pro-inflammatory role in rheumatoid arthritis. Patients with rheumatoid arthritis had raised levels of sIL-2R both in their sera and in their synovial fluid compared to patients with osteoarthritis and age-matched healthy controls. Mononuclear cells from the synovial fluid of rheumatoid arthritis patients were found to produce spontaneously high levels of sIL-2R which eluted at approximately m.w. 40,000 on gel filtration. In contrast, autologous peripheral blood cells only produced comparable levels upon stimulation with mitogenic lectin. Sequential studies indicated that serum sIL-2R levels were high ly correlated with disease activity (9). Arthrinox capsule compose of centella asiatica juice powder, black sesame extract, isolated soy protein, guava fruit juice powder and mangosteen aril juice powder, each of these components has the ability to increase collagen synthesis (10-13). 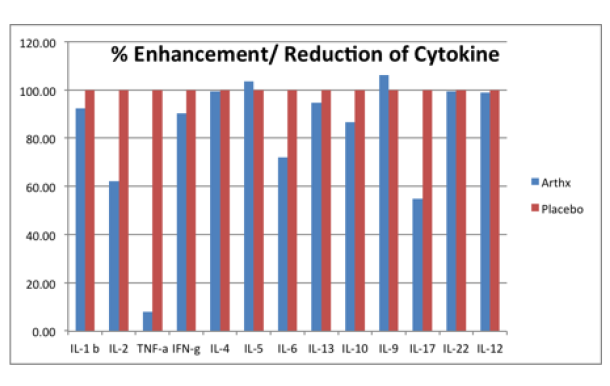 Interestingly, in the present study, we demonstrated that Arthrinox can modulated the immune cell functions by reducing the production of several pro-inflammation cytokines including IL-2, IL-17 and TNF-a. Arthrinox is therefore suggested to be the food supplement for management of RA patients. 2. H. Matsuno, K. Yudoh, et al. 2002. The role of TNFα in the pathogenesis of inflammation and joint destruction in rheumatoid arthritis (RA): a study using a human RA/SCID mouse chimera. Rheumatology. 3. Elliott, M.J., et al. 1993. Treatment of rheumatoid arthritis with chimeric monoclonal antibodies to tumor necrosis factor alpha. Arthritis Rheum. 36:1681-1690. 4. Elliott, M.J., et al. 1994. Randomised double-blind comparison of chimeric monoclonal antibody to tumour necrosis factor alpha (cA2) versus placebo in rheumatoid arthri tis. Lancet. 344:1105-1110. 5. Maini, R.N., et al. 1998. Randomized placebo-controlled trial o f multiple intravenous infusions of anti-TNFα monoclonal antibody with or without weekly methotrexate in rheu matoid arthritis. Arthritis Rheum.41:1552- 1563. 6. Kolls, J.K., Linden, A. 2004. Interleukin-17 family members and inflammation. Immun ity. 21:467-476. 7. Koenders, M.I., et al. 2005. Blocking of interleukin-17 during reactivation of experimental arthritis prevents joint inflammation and bone erosion by decreasing RANKL and interleukin-1. Am. J. Pathol. 167:141-149. 8. Lubberts, E., Koenders, M.I., van den Berg, W .B. 2005. The role of T-cell interleukin-17 in conducting destructive arthritis: lessons from animal models. Arthritis Res. Ther. 7:29-37. 9. Nathan Wei. IL-2 in rheumatoid arthritis. The Journal of Immunology. 141: 8, 2612-2618. 10. Jirat Nganlasom, Tunda Suttitum, Dusit Jirakulsom hok, Anu ha Puapairoj. 2008. Effect of Centella asiatica Linn. Leaves and Garcinia mangostana Linn. Hull on the healing of dermal wounds in diabetic rats. Srinagarind Med J. 23 (4), 402-407. 11. Tokudome Y, Nakamura K, Kage M, Todo H, Sugibayashi K, Hashimoto F. 2012 . Effects of soybean peptide and collagen peptide on collagen synthesis in normal human derm al fibroblasts. Int J Food Sci Nutr . Sep;63(6):689-95. 12. Kishimoto Y, Saito N, Kurita K, Shimokado K, Maruyama N, Ishigami A. 2013. Ascorbic acid enhances the expression of type 1 and type 4 collagen and SVCT2 in cultured human skin fibroblasts. Biochem Biophys Res Commun. 11;430(2):579-84. 13. Phitak T, Pothacharoen P, Settakorn J, Poompimol W, Caterson B. 2012. Chondroprotective and antiinflammatory effects of sesamin. Phytochemistry. 80:77-88.